Jude Magdalyn Henries. How I loved this character's snark in the first book in her series, Shades of Gray (here's my review). I was thrilled to participate in another tour for a L.M. 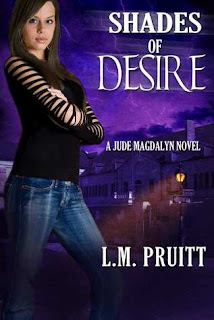 Pruitt novel, today's Shades of Desire blog tour. My review of Jude's latest story will be up later today. Blurb: All I wanted was a little peace and quiet. About the Author: L.M. Pruitt has been reading and writing for as long as she can remember. A native of Florida with a love of New Orleans, she has the uncanny ability to find humor in most things and would probably kill a plastic plant. 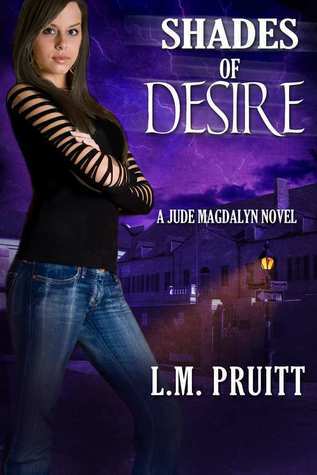 She is the author of the Jude Magdalyn Series as well as New Moon Rising, featuring Cari Gravier, and Taken, featuring Frankie Post. She is currently at work on the next book in the Moon Rising series, Harvest Moon Rising, due out April 2012. Ms. Pruitt makes her home in Florida with two cats--one smart, the other not so much. I love this book. The snark is deifinitely a hugh draw.